There is some sort of unspoken of serenity in watching the windows while the air raids occur. It's as if the more I stare the less likely it will be our turn. You think you'll grow accustomed to the bombings but you don't. Every time a missile hits the ground it feels like the first day. Even after the raid stops I still await the next hit or when it will in fact be me. A shudder then a loud boom. I am impressed by the strength of my frail window made of steel and glass. I know at some time, some year, I will no longer hear an air raid, but by then I'll be too accustomed. With every bomb drop I wonder why me? What makes me so special? Why hasn't my youth been stolen? These war crafts have destroyed everything dear to us. They've killed our president, and with every passing day I wonder when this will end? When will we get the chance to move forth? It's funny how each missile has it's own unique terror code, each one scares you in a different way, each one attacks a different family, some leaving only a lone child while others wipe out the whole family. I am still glaring at the black window and dim light praying it won't be us. Fear controls us even if we want to be unweathered by death the fear still encompasses us. Death is frightening because you can't guarantee anything. I return to watching the darkness of the window, then I fall asleep. I wake up the next day and I am embraced by shock. I know or actually I don’t know how the people of my mighty country have all this courage. The courage to play a never ending game of Russian roulette, when even their death will be unspoken of, unheard of, undeclared. When they might end up in a pile of ashes when you can't tell apart a man of 80 years and young boy of 20. They will all merge together, souls uniting into one. As our great president Saleh Al-Sammad has been murdered by an airstrike led by the Saudi-American coalition, I wonder when it will be me. 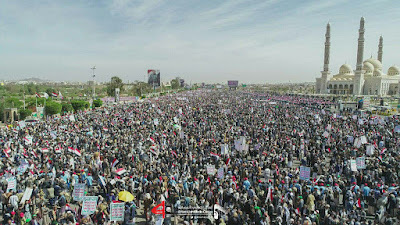 I now watch the free people of my country gathering to show their loyalty to our martyred president, and the soldiers marching their way to show our strength. The people at home watching the TV wishing they were there. 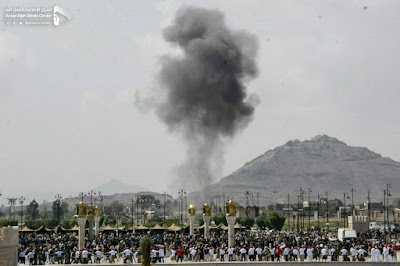 There are missiles falling a few meters away from the funeral and yet they stand there paying their condolences with no fear, once again playing another game of Russian roulette and I am once again astonished by how fearless they are. The Saudi-American coalition targets each and every Yemeni civilian, with absolutely no interest to whether they are civilians or not. Yet, Yemenis still go out and still play the game and still win every time. They still beat the odds, even when there are casualties it doesn’t hold them back. It only pushes them forth. We will not sunder or surrender, we will stand tall against the world. We will be patient, we will continue to bet on God; on ourselves.